The 2014 Vancouver Zombie Walk takes place tomorrow from 3:00 - 6:00 pm, starting at the Vancouver Art Gallery. Thomas FX is fully stocked with everything imaginable for creative Zombies . 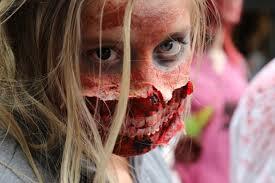 . . professional makeup effects, blood, zombie clothing, props, and Walking Dead Contact Lenses. We are open today until 5:00 pm, and tomorrow (Saturday) from 10:00 am till 2:00 pm. Drop by for last minute Zombie Walk supplies and remember. . . have fun, stay safe, and don't do any damage.